« Ask an Airline Pilot: Why Do I Feel So Worn Out After a Flight? This entry was posted on September 29, 2012 at 1:44 pm and is filed under air travel, airline, airline delays, airline pilot blog, airliner, airliner take off, flight crew, passenger bill of rights, pilot with tags a day in the life of an airline pilot, air travel, airline, airline captain, airline pilot blog, aviation, lightning bolt, radar dish, transportation, travel, vacation. You can follow any responses to this entry through the RSS 2.0 feed. You can leave a response, or trackback from your own site. junior, ho-boy, ‘nuther day at the office, BT,DT!!!!!!!!!!!!!!!! “you speak’um truth”!!!!!! I know have, Randy, in the left seat of a 747 around the world! And after getting back from the Seattle turn last night, I’m needing the weekend off: just plain old tired. DCA again Monday. Well done, Chris. Thanks for ignoring us passengers, you just worry about the jet! Another great post and thank you. As I’ve said countless times, that’s why they call you Captain! I especially liked hearing your visual read on the FO’s opinion; it ain’t about what s/he says, but the non-verbal stuff. Did I mention something about being The Captain? Perhaps not the pr oper place, but I’m delighted to note that you are at least trying to fly, not taking a ‘sick day’ – or calling the fatigue that perhaps you should have, for that next day. Good work, Chris. Please keep them flowing. -C.
Yeah, the only reason they would ever delay an outbound and the subsequent flight from Seattle was because of the manning shortage, especially at the end of the month. I personally refuse to take part in any illegal job action that ultimately does nothing constructive and a lot that’s exactly the opposite. Makes no sense to me. Amen and thanks. “Professional Responsibility” includes showing up for work as ‘legally’ scheduled, even when one does not the terms and conditions. I’m glad to hear that you are flying. And I think we’d better quit before we get into territory that off limits for your your blog. 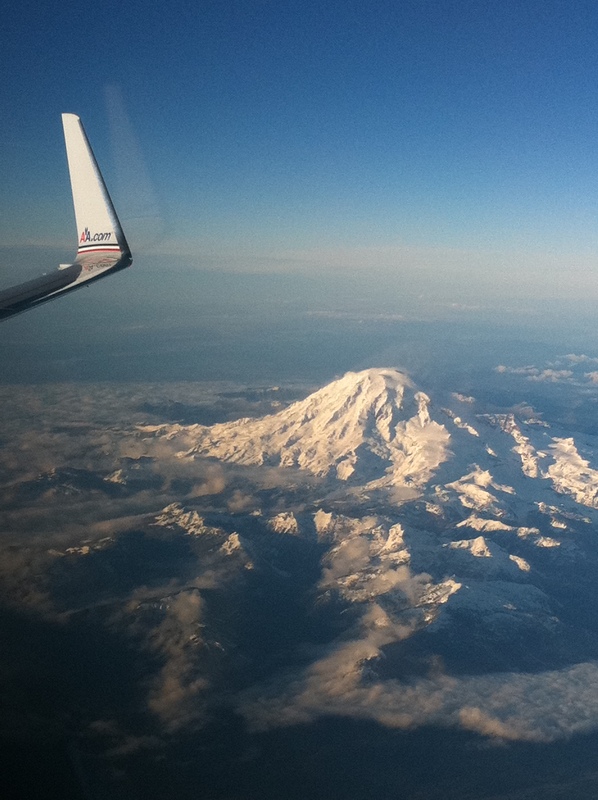 Best wishes, -C.
I always love to see Mt Rainier from the air. I am also always amazed to see St. Helens, a little to the south of Rainier. It is easy to see that half of that mountain is missing. There has been a lot of wild fires in eastern Washington (state) lately. Do these affect route planning at all? great post. My husband used to fly for Braniff and i enjoy your posts. The awards are – the Versatile Blogger Award and the One Lovely Blog Award. I suppose it’s mainly an excuse for me to point other people towards what you write, rather than keeping all your good stuff to myself. Still enjoying your high altitude thoughts. Just wanted to ask a question, not related to this blog, Do pilots fly with sunglasses on? If not then how do you manage with the sun? Also, are flight engineers allowed to interfere and use cockpit controls? Actually, we don’t have flight engineers any more. We wear sunglasses when required, although I’ve never owned a pair of “aviator” sunglasses–I think they’re kind of cliche and goofy-looking.